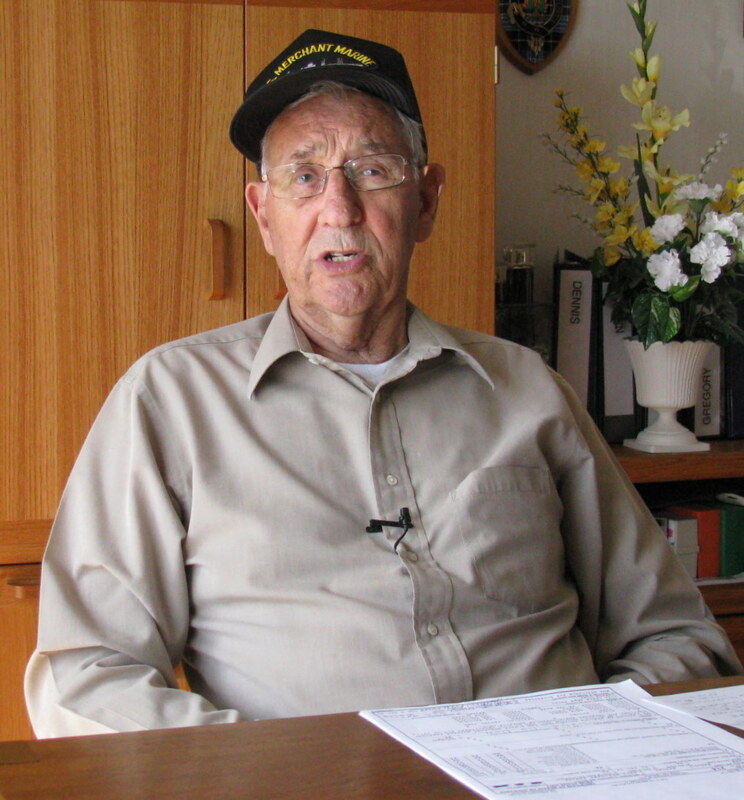 Harold Clark served as a 3rd Mate in the Merchant Marines during World War II. He sailed the Atlantic and Pacific in slow-moving Liberty and Victory ships filled with life-saving cargo for the war front and the home front. His most memorable trip was the third one he made aboard the Lew Wallace, a Kaiser built Liberty ship put together at the Richmond Shipyard on San Francisco Bay. “She was a ‘30 Day Wonder.’ That’s what they called them because they were built in 30 days. There were a lot of interesting stories told about these Kaiser ships,” the 88-year-old Punta Gorda mariner said. “It was 1943 and the Lew Wallace was anchored in the harbor at Adak, Alaska. A squall came up out of no where with hurricane force winds. We were ordered to pull anchor, get out of the harbor and sail for San Francisco,” Clark recalled. “We hoisted one anchor and started to pull the second one when it got fowled in the submarine net protecting the port. The anchor chain was clipped and left our starboard anchor in the sub net,” he said. “When the captain checked the seaman’s cabin he found a crack in the wall that formed the ship’s side and the crack continued down the other side of the ship, then across the boat deck above him. Worse, the crack kept opening closing as the ship rolled in heavy seas. “We had all our pumps working trying to keep the water out of the ship. By this time the ship was listing at a 15 degree angle and we lost our steering. We had to put a man on the wheel with the emergency steering in the stern of the ship,” Clark explained. Somehow they reached the entrance to San Francisco Bay without the ship breaking up at sea. At that point they took aboard a harbor pilot to guide the Lew Wallace into port. “’What about enemy submarines?’” Clark was asked. “It was aboard the Lew Wallace and I was still a cadet when I saw my only enemy sub. We were sailing in the Allusions when we picked up a submarine that seemed to be following us,” he said. “We winked at him with our blinker lights to see if he was an American sub. No response! “We put our aft five-inch gun on him and fired. No response, so we knew he was probably a Japanese sub,” the old salt said. “The gun we had mounted on the stern of the ship was a five-incher with a maximum elevation of 15 degrees. To scare him off we fired 10 shots at him, but we never hit anything. “I think the skipper of the enemy submarine must have gotten scared that we might get lucky with one of our shots and hit him. He disappeared. In addition to the Lew Wallace, Clark sailed aboard the Clarence Darrow, Halaula Victory, Cape Cleare and the George B. Selden. “I went to Guam in the George B. Selden. I was there when the war ended,” Clark said. “We had a cargo of beer and Cokes, but the people on shore said they had enough beer and Cokes and told us to anchor off and wait. “As we waited for a couple of months the crew began sampling our goods,” Clark said. “The skipper put out an order: ‘If you dump beer cans over the side open both ends with a can opener so they’ll sink.’ He didn’t want the empty beer cans floating around the harbor. Before joining the Merchant Marines and going to sea in 1943, Clark had a degree in chemistry. So when the war was over he went to work as a researcher in Shell Oil Company’s research lab. He worked for them for 26 years before retiring. He and his wife, Arnell, moved to Punta Gorda Isles in 2003, to be near their eldest son, Dennis Wesley Clark, who also lives in PGI. They have a daughter, Karen, in Glenndale, Calif., Scott in Washington, Utah and Gregory in Salt Lake City. If Clark has a beef with the military and his contribution to World War II, it’s that those who served in the Merchant Marines were not considered part of the military until long after the war. 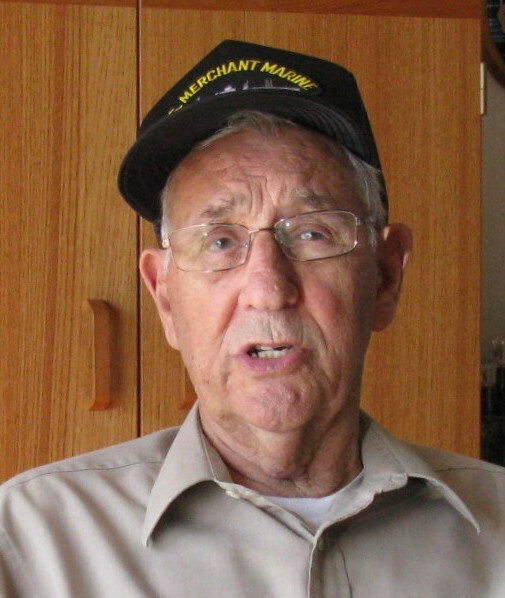 “Even though the percentage of fatalities in the Merchant Marines was higher than any other service branch we weren’t considered military,” he fumed. “Furthermore, we didn’t get VA benefits or the G.I. Bill until a few years ago. “It still bugs me,” he said. Currently as of June 2010: Punta Gorda, Fla. This story was first printed in the Charlotte Sun newspaper, Port Charlotte, Fla. on June 17, 2010 and is republished with permission. Click here to view Clark’s Collection in the Library of Congress’ Veterans History Project. Harold Wesley Clark, 93, of Punta Gorda, FL, died on Mar. 4, 2015. Funeral arrangements by: Roberson Funeral Home Punta Gorda Chapel. More than likely Harold Clark hauled my Dad back from Guadalcanal In 1943. He was a part of the 14th NCB (Seabees) stationed there from late 1942 to late 1943. 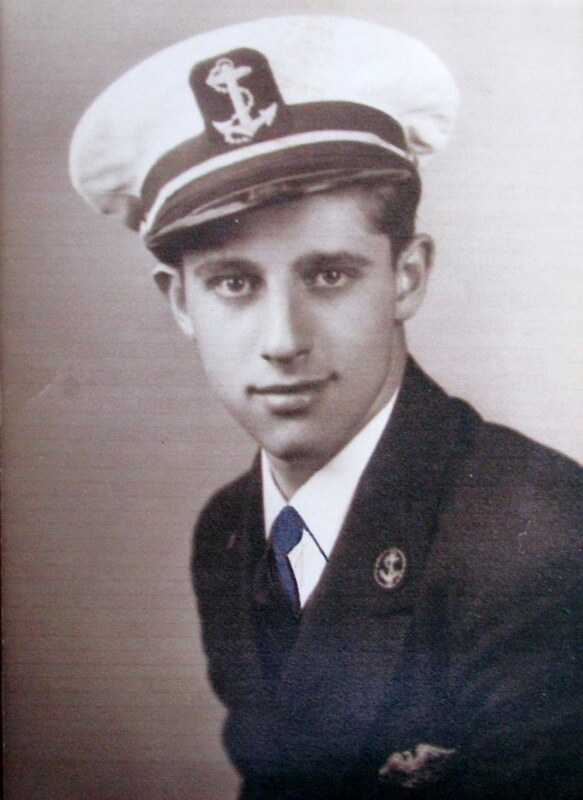 He left there for home in early November 1943 on the USS Lew Wallace, with one stop at Pearl Harbor on the way home. After a year of being shot at and dodging Japanese bombs, I’m sure they were all very happy to be aboard the USS Lew Wallace with Guadalcanal In their rear view!